What time does the Orange Umbrella Free Tour start? Old Town Tour – every day at 10:00 AM and at 1:30 PM. Ciudad Vieja en español – cada día a las 10:00; sábado y domingo a las 10:00 y 13:30. Best of Warsaw – every day at 11:00 AM. World War II in Warsaw – Monday, Wednesday, Friday and Sunday at 1:30 PM. Jewish Warsaw – Tuesday, Thursday, Saturday at 1:30 PM. All our tours start from the Sigismund’s Column in the Castle Square (entrance to the Old Town). Is there a free tour today? Yes, there is! ;) We run the tours EVERY day, three times a day, 365 (or 366:) days a year, holidays included. 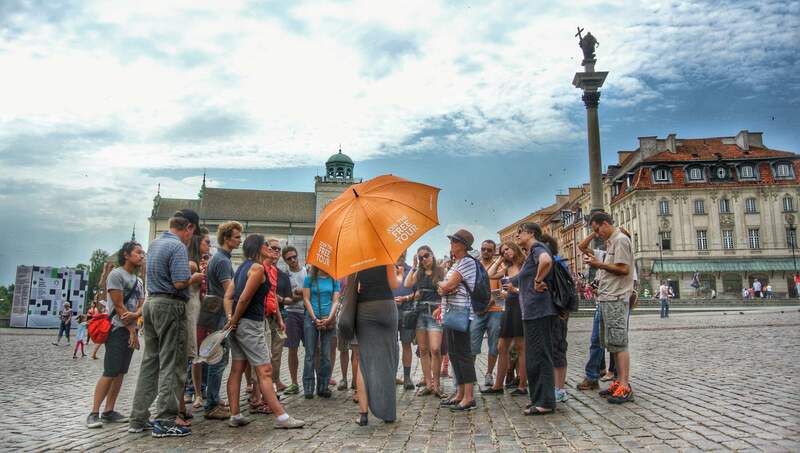 Weather conditions also don’t discourage us from showing you the best of Warsaw – rain or shine, snow or thunderstorm you can find our Orange Umbrella at the starting point. *ATTENTION! On 1st January the Old Town Free Tour starts at noon. You can book tours on our website. Choose a tour from here, pick a date from the calendar and fill a short form. Orange Umbrella Free Tours are pay-as-you-wish tours, so ‘free’ can mean several things. First of all, you’re free to join the tour. You’re also free to leave at any point if, for any reason, you’re not satisfied with it. But ‘free’ also means we don’t charge you with the tour ticket costs. We’re not financially supported neither by Warsaw city authorities nor by any sponsors. The only kind of remuneration our guides receive for the Orange Umbrella Free Tour is donations/tips they receive at the end of the tour. And again, you’re free to decide how much the tour was worth or how much you can afford to donate. Who are the guides? Are you students? We accept groups up to 10 people, if you’re an organized group consisting of more, we will be happy to offer a private, tailor-made tour at a reasonable cost. Please visit Station Warsaw website for a more detailed offer. Can I join the tour without reservation? If there are spaces you can join the tour without reservation. Without reservation, we can’t guarantee that you there will be one. We have often fully booked tours so we advise you to reserve a spot on our website, especially on the weekends. Our booking is free of charge. How many people are often on your tours? Our groups are limited to 25 guests. On the base of our experience, we know that the suitable number of people in the group allows our guest to have the best opportunity to explore Warsaw. We create this opportunity and during our tours: guests can hear the guide well, the guide fulfills the whole planned programme and even more, everyone can easily talk with the guide (during the tour and after it). I would like to come on the tour with my friend, can I book the tour for two of us? Yes, you can book for more than one person. During the reservation process change the quantity to the number of people that will join the tour. I book the tour, do I need to show the reservation? If there are spaces left there will be no problem joining the tour later. Please bear in mind that we can only hold reservations until 10 minutes before the starting time so it is very important to arrive on time. The tour can be also full and late arrivals won’t be able to join in. This also includes guests with a reservation as their space will have been given away to the other people. I have a reservation, what time should I arrive at the meeting point? We encourage you to be at least 10 minutes before the tour starts. Our guide needs 10 minutes for reservations checking and also for giving free spots to people without reservation.